A large rock of jade - photo from the DeLange's pictures of Seward Alaska (used by permission). Alaska has large deposits of this gemstone, including an entire mountain of jade on the Seward Peninsula. 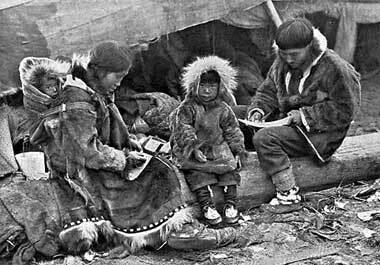 Prior to English exploration in the late 1700's, native Eskimos traded jade (as well as copper, hides and furs). The term "jade" is generic; it actually refers to three minerals - jadeite, nephrite, and chloromenlanite. The quality of Alaskan nephrite varies greatly; the finest material is usually found in smooth, stream-rolled boulders. 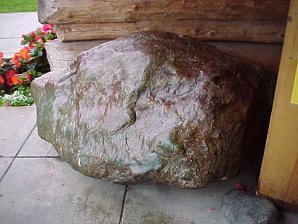 Many of these boulders are covered by a thin rind of brown material (a result of weathering) which must be removed to reveal the smooth green nephrite below. The color of jade ranges from shades of green, to yellow, red, black, and white (lavender jade is most rare and hence the most highly valued). Alaskan Eskimo family; public domain photo from Wikipedia.